So last year there was a Kellogg’s cereal rebate – $10 wyb 10 select Kellogg’s cereals. You could send in up to 5 rebates. It ended at the end of the year, and I had bought enough for a 3rd rebate but missed the cutoff mail in date. Bummer! A few weeks later, I threw the UPCs in my recycle. A few days later, I saw a posting on a blog about a NEW rebate. It was basically the exact same one, just a different expiration date and some of the cereal choices were different. Luckily, I hadn’t yet taken the recycle out and was able to fish out that envelope with the UPCs and send it in at the beginning of February. Yay! Some of that cereal had been specifically bought for that rebate and I would have wasted money. This new rebate expires 3/31/12 and so far I had sent in for only 1 of the 5. Good Kellogg’s coupons are scarce to come by so I was just biding my time for the right sale and promo and coupon combination to come along. I don’t need ANY cereal, so any I would buy would be for donation to coworkers so I wanted to make sure that if I did any more rebates, it would be make it so that the cereal was free (or a moneymaker). This weekend there were 2 great printables that came out and I managed to snag: A $5/5 ANY Kellogg’s cereals and a $4/4 of select size and varieties of Kellogg’s (select varieties are those in the rebate yay!). Now to match with a great sale. So Rite Aid does a lot of promos. In January they did a “resolutions rewards” where when you spent $100 in participating products, you earned a $20 UPR. There are dozens of products on the list. I didn’t really try for it and only made about $50. I probably could have gotten it without any or much out of pocket (OOP) cost if I had tried from the beginning, but it wasn’t worth it by the time I was really aware of it at the end of the month. Surprise surpise, they did it again in February! A new list of products but the same deal….spend $100, get a $2o UPR. This time around, I looked through the deals with an eye towards getting this UPR. But I didn’t want to break my previous rule about only buying items that are entirely free, a moneymaker, or something I will actually use and need that is still not much OOP. Here’s my tally so far. Prices are after tax, and after all UPR & SCR earned. Total actual cost after UPR/rebates: $7.89 moneymaker! Initially the $3.50 UPR x 4 from the toothpaste didn’t print on my receipt, so had them returned and bought them over again. Weirdly, it counted them twice for the winter rewards total. I figured when you returned something with your card, it would subtract it from the total, but not so far. It might do so the next time I’m at the store though, sometimes it takes a bit to process. I’m not going to work too hard to correct it, as I have had issues every single week with UPR not printing. I have to call customer service about 3 different weeks of shopping to have UPR credited to me that are missing. So far, I am NOT impressed by the new load2card feature where the UPR are supposedly loaded automatically….there’s been nothing but errors so far. The good news? I only have $7 (or possibly $20) left to spend to get my $20 UPR for the winter rewards!! Which means that I will definitely EARN at LEAST $8 from this promo. (that’s with spending the money to reach $100 without using a single coupon or getting a single UPR from those items) It is extremely possible that I will reach the $100 mark by buying freebies or moneymakers next week and will therefore EARN $28+ for this month, just from items on this promo!! 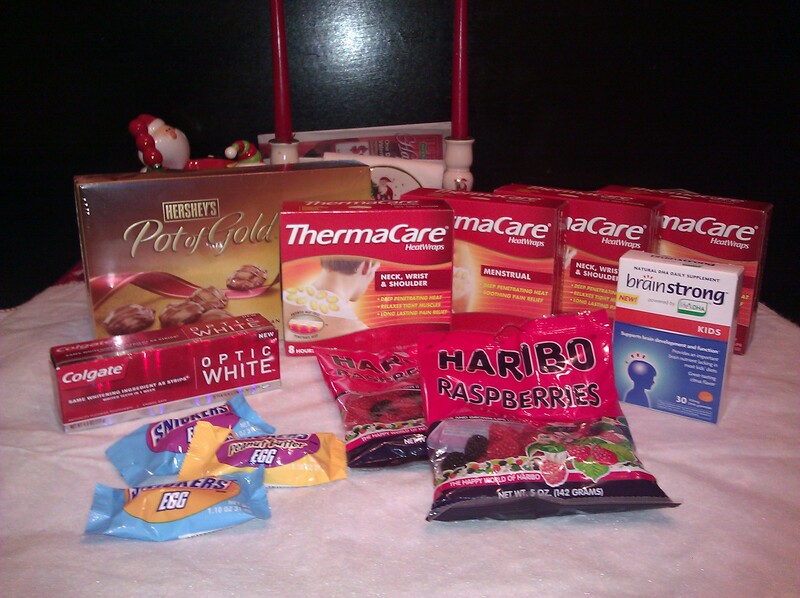 Can you say free clearance holiday candy?? 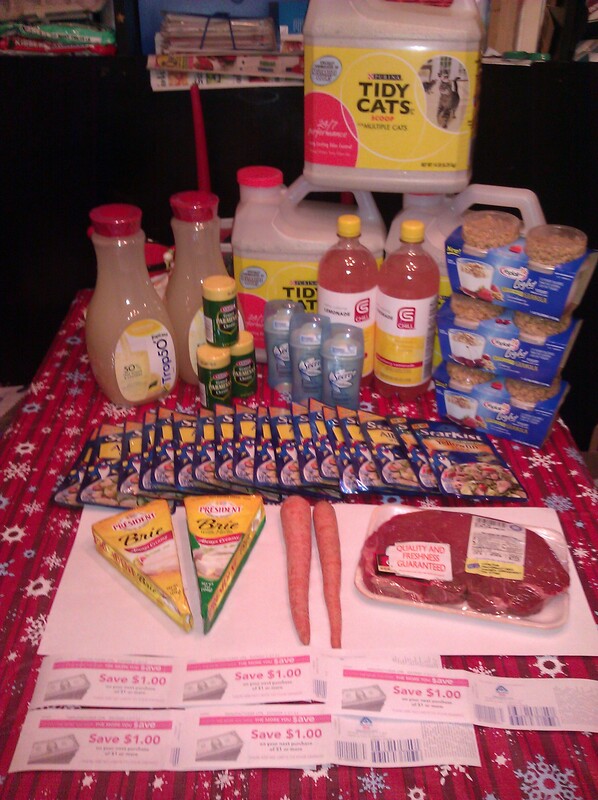 It was a doubler week, I used 36 coupons and 36 doublers to purchases these items. I have + $5 in leftover catalina coupons which can be used on anything as “cash”. Can also be doubled so this is really like $10. So REALLY, it’s like spending $7.55 on all this after doubling the catalinas. 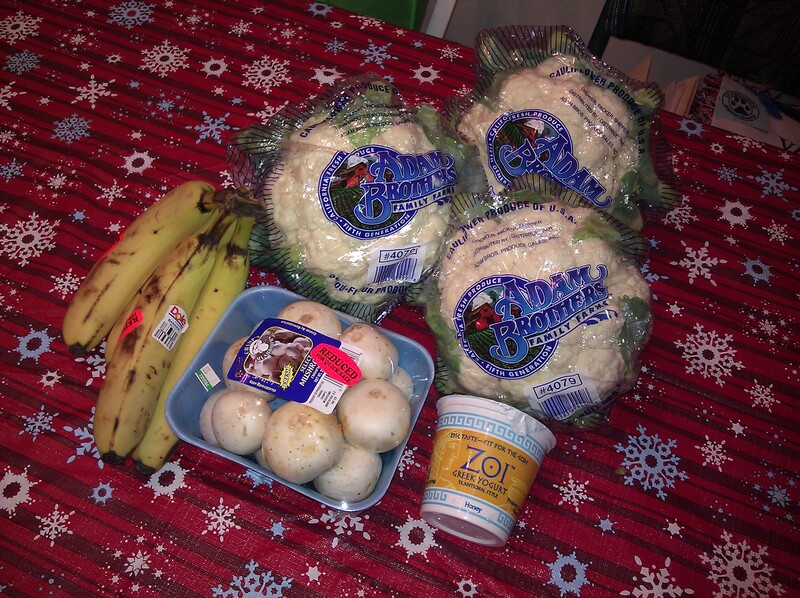 Altogether for the week, these purchases equal out to a total spent of $0.66! And this doesn’t even count the 14 pounds of tofu I got for FREE at Whole Foods……..so awesome. I could wax poetic about couponing and the last few weeks and whatnot but I have a bowl of homemade turkey chili and a new episode of Vampire Diaries waiting for me before bed. Hopefully I’m back soon with more amazing deals! 1. Stick to SB diet, Phase 2 for at least 3 months, then if ok, Phase 3 indefinitely – well I think I stuck to P2 pretty well for about 2 months. Then some slip-sliding and cheating before I just gave up SB as a formal eating plan. I did better in general through the rest of the year with eating a bit more veggies (not enough) and more whole grains (but a lot of white rice/pasta again) but portion control got a little excessive. And candy. Always candy. One of my biggest issues is snacking on weekends and not planning out meals, just winging it. 2. Outside of SB, new drinking rules: no drinking between work shifts during workweek, only drinking when in a good mood, no more than 2 glasses of wine or one mixed drink when home alone, ok to drink more if with friends – yeah….this went well for awhile. Then I started going out for breakfast with one of my coworkers on her Friday (after my 2nd of 3 shifts) and would usually have 1-2 mimosas. And I found more and more reasons to have drinks at home. Now my tolerance level is ramped up to an entire bottle of wine or 4-5 mixed drinks in an evening. NOT GOOD. In general what I have found works best is to just not buy bottles of wine or hard liquor at all. If I really want a drink, I buy 1-2 mini bottles so that I cannot overindulge at home. 3. Exercise! Stick with it! SB exercises EOD-q3days, yoga 2x weekly, walking/intervals EOD-q3days, ice-skating 2-4x monthly, dancing 1-2x monthly. – uhhhh. yeah. I never really started doing any of this. Occasional SB strethes. I did find a squar dance group at the end of the year and went a couple of times. 5. Get accepted to take VECCS exam (March), study daily SOMETHING, take test at VECCS (Sept), pass and get VTS (ECC) in November! – I did it! I passed! I am now a LVT, VTS (ECC) Woot woot!! 6. Date! – ohhh hahahaa! There was this one guy. He was a huge letdown as nothing remotely romantic happened on our “dates” Oh well. I was pretty busy most of the summer pretending to study for my boards so I didn’t put myself out there at ALL. So what is on the agenda for 2012? Let’s see! 1. Continue with south beach again. Maintain on phase 2 for 2-3 months, then ease to a phase 3 and really commit to making this a permanent lifestyle change. I’ve found several new recipes which are phase one friendly, giving me a much wider recipe base to work with so its been even easier this time around. I think committing to this lifestyle may be a bit of a continual cyclical thing for me in some ways. 2. Exercise! Seriously. My back/hip pain last year just got to a really annoying level. My cardio, core and hand strength and flexibility is at an all-time low. I’m entirely sick of it. I finally bit the bullet and joined a gym. I obviously need that level of mental coercion and financial commitment. I also signed up with a trainer for accountability though we’ll see how that part works out. Plan: Go to the gym at least 3 times/wk (aim for 4 eventually). Do yoga 1-2 times/wk. Go square dancing 2-4 times/month. When it’s warm, walk the dog on my days off. Go ice skating 1-2 times/month. 3. Drinking. Continue with the resolutions from last year: no drinking between work shifts during workweek, only drinking when in a good mood, no more than 2 glasses of wine or mixed drinks when home alone, ok to drink more if with friends. 4. Socialize! Date a bit, hang out with friends, make efforts to go out with coworkers and develop new friendships. Ok, not going to go too crazy this year. I want to just be a physically and mentally more healthy person. 2012 is the year of ME!